Ellovi is a small company dedicated to making 100% natural body butters that will leave your skin soft and hydrated. To learn more about this up and coming company, check out their story here -> Ellovi- What we’re all about. 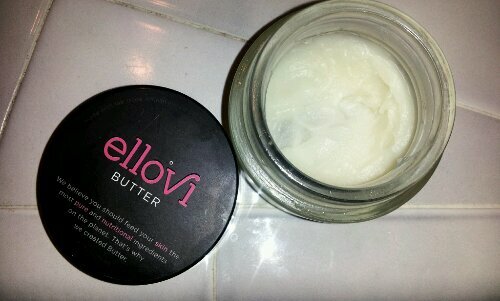 I received aÂ 3.5 ounce jar of butter courtesy of Ellovi.com to try it out and review. It arrived in the mail fairly quick, with a small note to place in refrigerator if it arrived melted. Due to it being summertime and pretty hot weather, it did arrive melted. So the note was a great idea on their part. After aboutÂ ten minutes in the fridge, my body butter was ready to use. The butter smelled a lot like coconut- which was a nice surprise to me as I expected the typical shea butter ingredients. It’s the perfect solution for dry skin and since it is made of 100% natural ingredients might beÂ good for all skin types to try out.Â It has no harsh chemicals or parabens, no animal testing or secret ingredients. Ellovi butter is made up of macadamia seed oil, coconut oil, hemp seed, marula nut, organic corn starch, and shea. It’s also made in California, and certified a vegan product. I used Ellovi on my belly and legs mainly, but it’s designed for all over use. I also tested it on my face a few times, it was very lightweight and non-greasy, which is the perfect combination for all-over body butter. I love body butters because they are richer than lotions and feel like they moisturize much better, but cannot stand when they leave a greasy feeling especially on your face as it can lead to breakouts. Ellovi had a silky texture and applied smoothly, while penetrating your skin quick enough to avoid walking around with that greasy-feeling. Simply apply in a circular motion all over your body and enjoy the softness to follow. The perfect solution for dry knees and elbows, yet gentle enough for sensitive areas like your face and neck. If you are a body butter lover, this is one product you need to try- you will not be disappointed. The coconut scent alone set it apart from other body butters I have tried.Â Did you know that water-based butters actually drain your skin of moisture rather than hydrating?Â Well, now you do! I read up on Ellovi’s page this interesting fact, and lucky for you Ellovi butter is not water-based; meaning it will moisturize your skin and keep it hydrated. Check Ellovi out at Ellovi.comÂ to learn more benefits about their butter and purchase yourself one of their eco-friendly jars. Try it out and let me know how you liked it!